If you have had an aquarium for any length of time you will, no doubt, have experimented with the types of fish you keep in a tank. Cichlids remain a popular choice for many amateur fish tank owners because they are lively fish that always seem to be doing things. It seems that people can relate to cichlids because they display many traits that we can recognize in ourselves. This makes for good viewing. Lake Malawi Cichlids are a type of fish you may want to keep in your tank. This article will briefly describe the nature of these fish and their ideal habitat. This can give you an indication of the type of aquarium you need to keep these animals. Lake Malawi is a large Lake situated on Malawi's northeastern border with Tanzania and Mozambique. It is part of the great lakes of the African rift valley along with the better known Lake Tanganyika and Lake Victoria. The water is generally alkaline and has a Ph level of 7.7 to 8.6. The temperature of the water varies from 27-29 degrees Celsius on the surface to about 22 degrees Celsius at lower depths. The two main types of cichlids that can be found in Lake Malawi are the haplochromines and the tilapiines. Like most cichlids, Lake Malawi cichlids are known for being territorial and aggressive towards each other. They are mouth brooders. They are particularly noted for the vivid colors and markings. There is such a variety of species that it would be impossible to name all of them but the most colorful are possibly the peacock cichlids. Popular peacock cichlids are the Melanochromis auratus and the Labeotrophus trewavasae. While in many species of cichlids only the male has the vivid markings, in these two species both sexes have colorful markings. Another reason for the popularity of the Melonachromis auratus is that the fry displays the same colors and markings as the parents but only in miniature. Most are adapted for feeding off algae attached to rock or substrate. When creating a habitat for Lake Malawi cichlids it is important to keep the water quality alkaline. The aquascape should feature rocks and substrate similar to the environment in Lake Malawi. The rocks will allow the fish to hide and feed on the algae on the rocks. To combat the territorial nature of the fish you could densely stock the tank. Given that the tank is densely stocked you should have a strong filtration system set up to maintain the water quality. Typically they eat flake, bloodworm and pellet foods. Lake Malawi cichlids are some of the most beautiful fish in the world and are active and fun to watch. They remain one of the most popular types of fish to keep in a tropical freshwater fish tank. If you have decided to set up an African cichlid tank, odds are that this is not your first aquarium. I first decided to keep African cichlids after seeing some red zebras and yellow labs in a pet shop and wondering why these colorful fish were not in the saltwater section. I had never seen such colorful fish that were not saltwater fish. African cichlids are also very interesting to watch. They are a territorial fish with a bit of an attitude. This can be handled by proper stocking of your aquarium. First, you must decide which of the three lakes you want to set your aquarium up to imitate. African cichlids come from Lake Tanganyika, Lake Victoria, and Lake Malawi. All three of these lakes have hard water with a high pH. I would suggest starting with mbunas from Lake Malawi. Mbunas are a class of rock-dwelling, mouthbrooding, and omnivorous cichlids. The common varieties can be found in most local pet shops and are not very expensive. Mbunas require a lot of space and hiding spots in their aquarium. You should use a 55-gallon aquarium or larger to keep these cichlids. You can use limestone or holy rock (limestone rock with lots of holes) and caves. These are usually placed towards the rear of the tank which allows for a free swimming area at the front of the tank. A common substrate used in mbuna aquariums is crushed coral. Using crushed coral as the substrate helps maintain the elevated pH and water hardness. Cichlid tanks require a lot of filtration to keep the inhabitants healthy. I usually use two large sponge filters in each of the rear corners in combination with a large filter hanging on the back of the tank or two smaller ones submerged within the tank. The hanging filter (or the submersed ones) cleans particulate matter from the aquarium while the sponge filters house large quantities of the bacteria which convert ammonia to nitrites and the nitrites to nitrates. African cichlids require a water temperature of around 80 degrees F. This will most likely require a 150-watt heater on each end of a 55-gallon tank. The submersible type with a temperature setting is preferred. They cost a little more but are worth it. They will last much longer than the less expensive ones that hang on the back of the tank. After the aquarium is set up with the proper substrate, plenty of hiding spaces, heaters, filters and filled with dechlorinated water, you need to determine the pH and water hardness. You can buy water test kits at your local pet shop. With the limestone and crushed coral, you have already elevated your pH and water hardness from what it comes out of your tap. You will need a pH of 7.4 to 8.6 and a water hardness of 10.0 to 20.0 dH. It has been my experience with relatively soft tap water with a neutral pH that if I use the cichlid tank setup described above, all I need to do is adjust the water hardness and the pH is right where I want it. Test your water hardness. If your tap water is hard enough, you may get lucky and not need to make any adjustments. Most likely though, you will need to increase the water's hardness. You can elevate the hardness using African cichlid salt. You can find this at your local pet shop or online. Add the cichlid salt until you reach a hardness level around 15.0 dH. At this point, check your pH. Your pH should be around 8 at this point. If necessary, you may need to adjust it also. This is unlikely, once you have elevated the hardness to this level. Now you can purchase your first African cichlid. Initially just purchase one cichlid for the tank and let it have the tank to itself for about two weeks. This will give the aquarium time to grow the bacteria necessary to break down waste in the tank in what is called the nitrogen cycle. You can get around this by setting up one of the sponge filters in an established aquarium for a couple of weeks prior to setting up your cichlid tank. This way the sponge filter will have all of the bacteria needed for the nitrogen cycle. When you then move it to your new tank, you have effectively moved the bacterial colonies that the new tank requires. At this point, you have your African cichlid tank up and running! If you chose mbuna for your tank, feed them spirulina flakes and cichlid pellets. Once it is fully stocked, perform 30% to 50% water changes on a weekly basis. Vacuum the gravel when you do this and you will have a healthy, thriving community of African cichlids. One last note: The large sponge filters and large water changes may be relics of my years keeping discus, which require a very clean tank. I can tell you from experience that you will very rarely if ever have health issues with your fish if you keep an aquarium in this manner. Tim Montey has kept and bred fish as a hobby off and on for more than 30 years. Lake Malawi is part of the East African Rift valley system (meaning it lies in the East African rift caused by the African tectonic plate splitting in two) and is located in southern Africa. It is the ninth largest lake in the world and the third largest in Africa with a surface area around 29,600 km. It is situated between the countries of Malawi, Tanzania, and Mozambique. The lake is often called Lake Nyssa as there is still a debate between bordering countries. 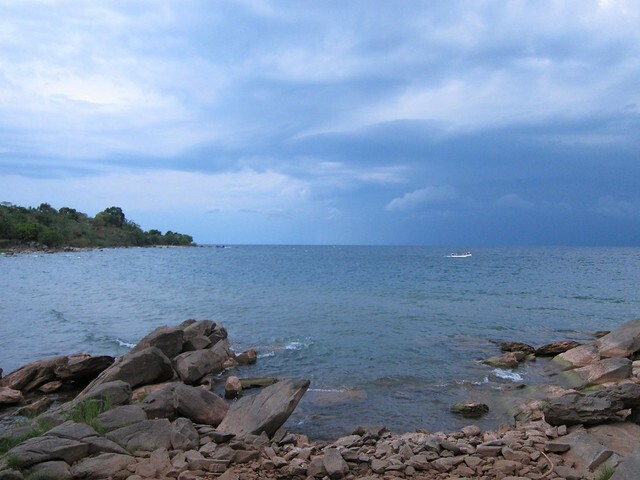 Lake Malawi consists of a single large basin that is approximately 506 km long and 75 km wide at the widest point. The lake's maximum depth is 700 m and it has a mean depth of around 292 m. Lake Malawi is unusual because it does not have tides or currents. The lake is fairly warm with a deep level temperature of around 72o and with a surface temperature of 75 - 84o. The reason for the 9o F fluctuation in temperature is that Lake Malawi lies far enough south of the equator to experience definite seasonal variations in temperature. The pH ranges from 7.7 - 8.6, the gH ranges from 4-6 dH, and the kH ranges from 6-8 dH. There are several main cichlid habitats within the lake. The first is the sandy shoreline that makes up about 70% of the coast. Some plants live in this area, but not many. Haps and peacocks use this as their habitat. The second area is the rocky shoreline that makes up the remaining 30% of the coast. Here there is no vegetation and rocks are piled on top of each other. The rocky areas tend to be where the shores have a steep drop off. Mbunas make this their habitat (hence their name which means "rock-dweller"). The third area is the river mouths and area close to shore that is highly vegetated. These areas tend to be shallow and can also be fairly muddy. Lastly, the deepwater zones that go from 30 m to 250 m deep are inhabited by some of the larger predatory cichlids.